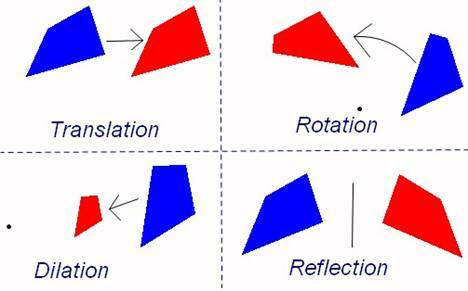 Polygons are “congruent if their sides and angles can be paired so that all of the corresponding pairs of sides and angles are congruent.” Translations, reflections, rotations, and dilations are transformations. Translations, reflections, and rotations create images that are congruent to the original figures. Dilations create images that are smaller or larger than the original figures but retain the same shape. The corresponding angles of the original figure and the new image are congruent but their side lengths are not. In a dilation, the original figure and the new image are similar (same shape, proportional sizes). In elementary school, a translation was called a slide. A reflection was called a flip, and a rotation was called a turn. IXL-Click on skills Q.1 through Q.11 to practice your transformation skills. IXL limits you to 18 questions per day if you are not a member.